Elaeis guineensis var. madagascariensis Jum. & H. Perrier, Elaeis madagascariensis (Jum. & H. Perrier) Becc., Elaeis melanococca Gaertn. The fruit of the oil palm tree (Elaeis guineensis Jacq.) has a thin epicarp, a fleshy and oily mesocarp and a hard endocarp that contains an oil-rich endosperm (kernel) (Vaughan et al., 2009). Palm oil is extracted from the mesocarp. In a second step, the nut is cracked to release the endosperm (kernel). These kernels are usually sent to another processing unit to be pressed or treated with a solvent to extract palm kernel oil, an oil rich in lauric acid (44-51%) but they are sometimes fed directly to livestock for their high energy content (Gervajio, 2005). 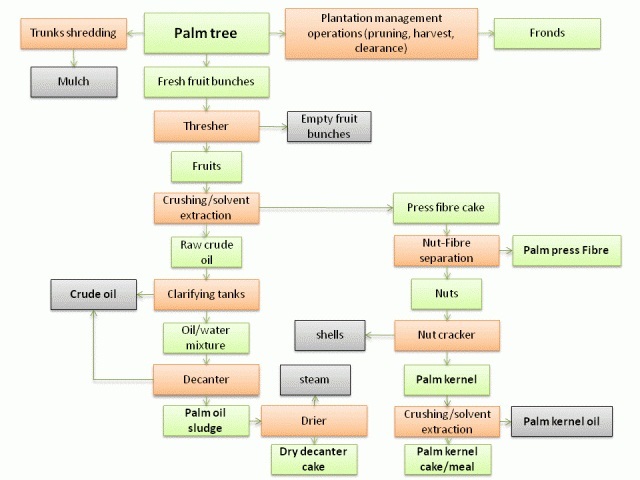 Oil palm kernels are available in the vicinity of oil palm processing units. Palm kernels are hard and should be crushed before being fed to livestock (Vargas et al., 2003). 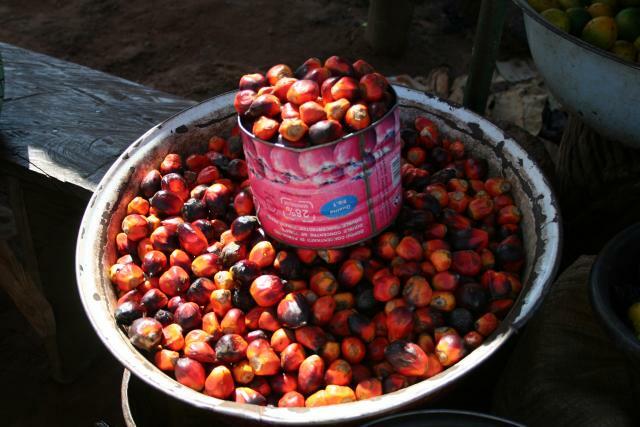 Oil palm kernels DM contains about 46-54% oil, giving them a high gross energy content (28.9 MJ/kg DM), which make them valuable as a potential replacement for high-energy ingredients. However, they are contaminated with variable amounts of a fibrous and lignified endocarp (3-13%) and, therefore, the DM contains between 12 and 15% crude fibre (Zumbado et al., 1996). They are also relatively poor in protein (about 10% DM). In dual-purpose grazing cows fed 1 kg/d of a supplement containing 0 to 33% palm kernels, the inclusion rate of 25% gave the best dairy performance and was also the most profitable. While calf growth did not benefit from the kernels, the cows fed them gained weight, unlike those fed the control diet (Rojas et al., 1987). Palm kernels were found to be a valuable alternative ingredient for increasing the metabolizable energy levels of broiler diets based on soybean meal, maize grain or sorghum. However, results are contradictory. In Nigeria, the inclusion of more than 5% palm kernels in broiler diets reduced growth and feed intake, and increased the feed to gain ratio (Oruwari et al., 1996). 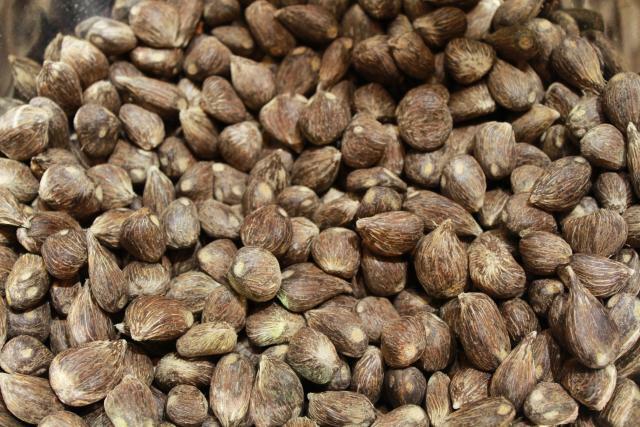 In Costa-Rica, palm kernels could be included at up to 20% in broiler diets to increase energy or replace tallow and soybean oil, though performance decreased when they replaced more than 50% of the soybean oil (Zumbado et al., 1992). When included at 20% in broiler diets, variations in endocarp content (from 0 to 15%) did not significantly affect broiler performance (Jackson et al., 1996). In laying hens, palm kernels were found to be a useful alternative to maize grain when this ingredient was scarce and kernel prices were low. Palm kernels could replace up to 33% of the maize grain in the diet without significantly influencing feed intake, average egg weight, hen-day production, body weight gain, protein and fibre retention though fat retention was affected (Adekoya et al., 2004). The energy value of palm kernels is high: TMEn values range from 18.8-20.0 MJ/kg DM for cockerels (Zumbado et al., 1996) to 25.5 and 25.6 MJ for broilers and laying hens respectively (Oruwari et al., 1996). Contamination with pericarp residues influences the nutritional value of palm kernels: TMEn values decreased from 20.0 to 18.8 MJ/kg DM when the amount of endocarp increased from 0 to 12% (Zumbado et al., 1996). The asterisk * indicates that the average value was obtained by an equation. Gervajio, G. C., 2005. Fatty acids and derivatives from coconut oil. In: Bailey’s Industrial Oil and Fat Products, Sixth Edition, John Wiley & Sons, Inc.
Nwokolo, E. ; Smartt, J., 1997. Food and feed from legumes and oilseeds. Springer, 419 p.